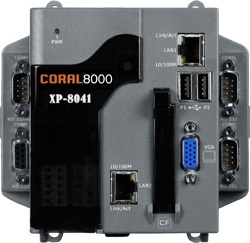 The CORAL-8041-64 solution consists of the CORAL unit without a backplane for plug-in I/O Cards and a SCADA Package which will handle up to 64 I/O tags. The software also includes 6 independent logfiles, 256 User Defined Analog Channels (for setpoints etc), 256 User Defined Digitals Channels (for virtual switches etc) and 256 Derived Calculator Channels for data manipulation. A single driver is included while various additional drivers are available as options.